Vincent Rosenblatt was born in Paris in 1972. He lives and works in Rio de Janeiro, Brazil. After studying history, Vincent Rosenblatt travelled to Poland on several occasions between 1989 and 1997 which sparked his interest in photography. He enrolled as a student in Paris at the École Nationale des Beaux Arts in the Atelier of Lesly Hamilton where he graduated in 2001. During the years 1999-2000, on a Colin-Lefranc exchange scholarship, he discovered Brazil for the first time. He moved to Rio de Janeiro in 2002 and set up a photography workshop called Olhares do Morro on the heights of the Santa Marta favela, providing a place where the youth living in the favelas could find their own expression and study photography. Some have proven to be extremely talented and successful photographers. Since becoming an association, Olhares do Morro has exhibited at the Unesco headquarters in Paris in 2004, at the Rencontres d’Arles photography festival in 2005, and was invited the same year to show at the Art Basel Miami Beach. Recently their work was showcased in Stockholm in 2006 and Brazil in 2007. Today various photographers from the favelas are represented by the Agencia Olhares, which has taken on the cultural vocation of the original association. The international press has regularly singled out their portfolios due to their immediacy and authenticity. 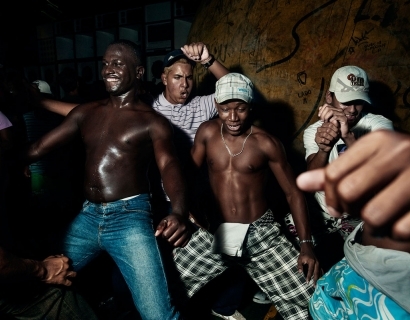 Since 2005, whilst working as a photojournalist, Vincent Rosenblatt has documented the underground scene of Bailes Funk and urban fringe culture in Brazil. His most recent exhibition was at the Maison Européenne de la Photographie in Paris in 2011. His work was published by the New York Times (Lens), GUP, Le Monde, Libération, Courrier International, VSD, Dagens Næringsliv, Repubblica Delle Donne, Têtu, Afisha-Mir, among many others.